Robin McLaurin Williams (July 21, 1951 – August 11, 2014) was an American actor and stand-up comedian. He first became famous on the television show Mork and Mindy. He starred in many movies. On August 11, 2014, Williams was found dead in his home. His death was believed to have been a suicide by asphyxiation. He appeared to have hanged himself with his belt. Williams was also found with cuts on his wrist. Williams was born in Chicago, Illinois on July 21, 1951. His father Robert Fitzgerald Williams (September 10, 1906 – October 18, 1987) worked for Ford Motor Company. His mother Laura McLaurin (née Smith, September 24, 1922 – September 4, 2001) was a former model from New Orleans, Louisiana. His great-great-grandfather on his mother's side was Mississippi senator and governor Anselm J. McLaurin. Williams' ancestors were English, Welsh, Irish, Scottish, German, and French. When he was young, Williams lived in Bloomfield Hills, Michigan and in Marin County, California. He studied at Redwood High School and at Claremont McKenna College. He studied to become an actor at the Julliard School in New York City and at the College of Marin. After his family moved to Marin County, Williams began his career doing stand-up comedy shows in the San Francisco Bay Area in the mid-1970s. His first performance took place at the Holy City Zoo, a comedy club in San Francisco, where he worked his way up from tending bar to getting on stage. Williams became famous for his role as Mork in the television series Mork & Mindy (1978–1982). His idol Jonathan Winters also appeared in the show. Williams went on to a successful career in both stand-up comedy and movie acting. He acted in the movies The World According to Garp, Good Morning, Vietnam, Dead Poets Society, Awakenings, The Fisher King, Good Will Hunting, Popeye, Hook, Aladdin, Mrs. Doubtfire, Jumanji, The Birdcage, Night at the Museum, and Happy Feet. Williams appeared in the music video for "Don't Worry, Be Happy" by Bobby McFerrin. In 2013, Williams starred as President Dwight D. Eisenhower in Lee Daniels' The Butler. Before his death, Williams starred in the short-lived comedy The Crazy Ones. It was cancelled shortly before his death. Once Williams got angry with Disney for using his voice as the Genie in Aladdin to sell merchandise for the movie. Disney tried to apologize to Williams. The Disney company bought a Picasso painting for him. Williams was nominated for the Academy Award for Best Actor three times. He received the Academy Award for Best Supporting Actor for his performance in Good Will Hunting. He received two Emmy Awards, four Golden Globe Awards, two Screen Actors Guild Awards and five Grammy Awards. Williams married Valerie Velardi in 1978. They divorced in 1988. In 1989, Williams married Marsha Garces. She divorced him in 2008. Williams married Susan Schneider in 2011. Their marriage lasted until Williams' death in 2014. Williams had a son with Velardi. He had a daughter and son with Garces. His son, Zak Williams, is an actor, businessman, and filmmaker. His daughter, Zelda Williams, is an actress. Williams lived in San Francisco and Paradise Cay in California. Williams was an alcoholic. He was also addicted to cocaine. He had strong depression in the final years of his life. On March 13, 2009, he had surgery to fix an aortic valve. The surgery was successful. One month before his death, Williams went to rehab for his alcoholism. 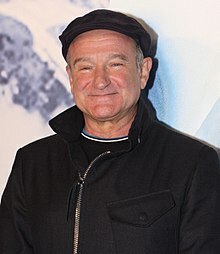 Williams' widow stated that he had been diagnosed with early stage Parkinson's disease before his death, but the actor was "not yet ready to share publicly" this information. In November 2014, it was revealed that Williams had Lewy body dementia. On August 11, 2014 at about 11:45 am, Williams was found at his home by his personal assistant. About ten minutes later, a 911 call was made saying that Williams was not reacting or breathing. He was pronounced dead at 12:02 pm, shortly after emergency personnel arrived. The Marin County Sheriff's department said the cause of death was probably asphyxia by hanging. Williams was cremated. His ashes were scattered in the San Francisco Bay. On December 16, 2014, it was revealed that, as a result of his death, Williams was the fastest growing search term on Google in 2014. ↑ "Rolling Stone Interview" (PDF). 2008. Retrieved August 13, 2014. ↑ Williams, Robin. Interview with Conan O'Brien. Late Night with Conan O'Brien. November 14, 2006. Assessed on August 12, 2014. ↑ 4.0 4.1 4.2 Williams, Robin. Interview with Michael Parkinson. Robin Williams, Parkinson interview 2002. Assessed on August 12, 2014. ↑ "Actor Robin Williams found dead in apparent suicide: sheriff". Yahoo! News. August 11, 2014. Retrieved August 11, 2014. ↑ 7.0 7.1 7.2 7.3 Levs, Josh; Duke, Alan. "Officials: Robin Williams apparently hanged himself with a belt". CNN. Retrieved August 12, 2014. ↑ "Robin Williams Autopsy Report Update: Coroner Confirms Belt Around Actor's Neck, Wrist Cut". Inquisitr.com. Retrieved August 12, 2014. ↑ "If Robin Williams' comedies are inspired by his life no wonder he's been in therapy". Sunday Herald. 1999-03-14. Retrieved 2014-01-05. ↑ Rubenstein, Steve (2001-09-08). "Laurie Williams – comedian's mother – SFGate". San Francisco Chronicle. Retrieved 2014-01-05. ↑ "Full text of "Anselm J. McLaurin (late a senator from Mississippi)"". Archive.org. 1911. Retrieved 2014-01-05. ↑ The Official and Statistical Register of the State of Mississippi, 1908, Pg. 977; "He [Anselm J. McLaurin] was married at Trenton, Miss., February 22, 1870, to Laura Elvira Victoria Rauch, daughter of John Rauch and wife, Epsilon Rauch, of Trenton, Miss. Mrs. McLaurin's paternal ancestors immigrated to America from Germany; maternal from England and Germany." ↑ "8 Facts You Might Not Have Known About Robin Williams". Time.com. Retrieved August 17, 2014. ↑ Thomas, Mike (February 24, 2002). "A nose for laughs". Chicago Sun-Times. Retrieved December 14, 2009. ↑ McMullen, Marion (October 5, 2002). "Article: Weekend TV: Star profile. (Features)". Coventry Evening Telegraph. Retrieved December 14, 2009. ↑ Aitkenhead, Decca (September 20, 2010). "Robin Williams: 'I was shameful, did stuff that caused disgust – that's hard to recover from'". The Guardian. Retrieved August 12, 2014. ↑ "Robin Williams's Heart Surgery Called a Success". ↑ "Robin Williams' heart surgery goes 'extremely well'". CNN. March 23, 2009. Retrieved May 22, 2010. ↑ "Robin Williams in Rehab to Maintain Sobriety". TMZ. July 1, 2014. Retrieved August 12, 2014. ↑ "Robin Williams 'had Parkinson's'". BBC. August 14, 2014. Retrieved August 14, 2014. ↑ "Report: Williams had Lewy body dementia". MSN.com. Retrieved November 11, 2014. ↑ "Investigation into Death of Actor Robin Williams" (PDF). Huffington Post. Marin County Sheriff's Office, Coroner Division. August 11, 2014. Retrieved August 12, 2014. ↑ Itzkoff, Dave; Fitzsimmons, Emma G. (August 11, 2014). "Robin Williams, Oscar-Winning Comedian, Dies at 63". New York Times. Retrieved August 11, 2014. ↑ "Robin Williams Dies of Suspected Suicide". The Hollywood Reporter. August 11, 2014. Retrieved August 11, 2014. ↑ Dillon, Nancy (August 20, 2014). "Robin Williams' ashes scattered in San Francisco Bay". New York Daily News.com. Retrieved August 20, 2014. ↑ "Robin Williams Discography". Discogs.com. 2014-08-14. Retrieved 2015-08-19. Wikimedia Commons has media related to Robin Williams.